A selection of items from Maldon Museum & Archives collection. 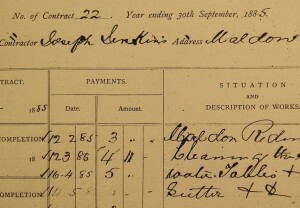 Work Contract details from Shire of Maldon records 1885 – the contractor was Joseph Jenkins, the ‘Welsh swagman’. Jenkins kept extensive diaries for most of his adult life and the entries recorded during his 25 years in Victoria, including 10 years in Maldon, provide a unique record of the life of a rural worker in and around the central Victorian goldfields. Within the museum some of these items on display are set up with QR codes and NFC tags to allow visitors to access the additional information while viewing the display. To read QR codes on a mobile device you will need a ‘QR Code Reader’ app. You will be able to download one for free from the App Store for iPhones and iPads, or the Play Store for Android devices. Once the app is installed you need to start it and point your device’s camera at the QR code, it will scan the code and display the web page it links to.